primaERP is a cloud application for monitoring the attendance, tracking time on projects and tasks as well as billing your clients. 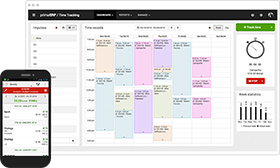 A smart time tracking app for individuals and/or teams, so you can see how much time you spend on your client, project, task and/or activity. See your time in the reports, which you can filter and group by client, project, etc., as well as in the team calendar. There are many features! The Billing module helps you create and manage your bills, based on the time records created in Attendance and/or Time Tracking. You can personalize the bills as well as add any extra incurred costs. Also, price your time accurately by creating hourly rates for the project, client, activity, etc. Easy to use and manage, which saves time, money and nerves. A cloud software, always and everywhere accessible. Trouble-free connection with other systems and applications. Made for the world. In 7 languages, including customer support. Secure and reliable connection with your data safely stored on our servers. The system is perfect. Congratulations, it is great. Impressed with primaERP. Loads of features to work with and a beautiful UI. I have changed my time tracking to primaERP. It is a really great tool. THANK you for this application, that is great & free! primaERP is being used in more than 100 countries and in more than 7 languages around the world. Please insert your primaERP account URL. The account name should be at least 3 characters long. Did you forget the URL of your account? This is not a valid e-mail. We’ve sent you en email with the access details for your account. Do you remember the URL address of your account?